The importance of teaching problem-solving skills is the focus of this ASCD SmartBrief contributed by Greg Bartus at CIESE, Stevens Institute of Technology. Stevens Institute of Technology and CIESE efforts highlighted in New Jersey Business article, "State is Progressive in Promoting STEM." A short history and overview of CIESE was featured in The Stevens Indicator article, “Teaching Excellence, STEM to Stern” It may be found on p.18-19 of the full issue. CIESE WaterBotics® program was highlighted in Erin Delmore's article in NJTVNEWS, "WaterBotics Program Introduces Kids to Science"
CIESE WaterBotics® program was featured in the Boys and Girls Club of Monmouth County blog, "Underwater Robots Making a Splash at the Boys & Girls Clubs"
CIESE WaterBotics® summer engineering design academy for Hoboken students was featured in the Hoboken Reporter, "Grade schoolers Study WaterBotics"
CIESE WaterBotics® program’s outreach is noted in ASEE First Bell bulletin, "Aquabots camp promotes science, math learning"
CIESE WaterBotics® program was highlighted in ABC - Action News, Philadelphia, PA, "Tupperware and Legos Turned into Robots"
CIESE PISA2 program was featured in Stevens University News, "Educators Learn to Use Stevens’ Solar Home as a STEM Teaching Tool"
CIESE WaterBotics® program was highlighted in Courtney Kane's article in Fios1news.com, "Summer campers take robots for a dip at Clifton Boys & Girls club"
CIESE WaterBotics® program was highlighted in Maggie Katz's article in NorthJersey.com, "Waterbotics in Clifton perfect for summer"
CIESE-led activities of the Hoboken Stem-A-thon was featured in an editorial to the Hoboken Reporter "Hoboken's first ever STEM-a-thon at Stevens Institute of Technology"
CIESE Director Arthur Camins’ commentary was featured in the Education Week blog, Leadership 360 by Jill Berkowicz and Ann Myers, "What Is This Thing Called STEM?" CIESE-led activities of the Hoboken Stem-A-thon was featured in hMag, "Stevens Hosts Hoboken 6th Graders for “STEM-a-thon"
CIESE WaterBotics® program was featured in Stevens University News, "WaterBotics® STEM Curriculum Coming to 10 NJ-based Boys & Girls Clubs, via Walmart Support and Stevens Partnership"
CIESE WaterBotics® program received a Facilitator’s Choice award in the NSF 2015 Video Showcase, "WaterBotics: Dive into Engineering Design"
CIESE Director Arthur Camins’ commentary in the Washington Post online is featured in The Answer Sheet by Valerie Strauss, "What the future of science education should look like"
CIESE Director Arthur Camins’ commentary in the Washington Post online is featured in The Answer Sheet by Valerie Strauss, "Why reports of progress on No Child Left Behind rewrite may not be a good sign"
WaterBotics® was featured in the television program, “One on One with Steve Adubato” which airs on PBS stations in the NJ/NY metropolitan area. CIESE was featured in Stevens NewsPoints, “Teaching Excellence, STEM to Stern"
CIESE Director Arthur Camins’ commentary in the Washington Post online is featured in The Answer Sheet by Valerie Strauss, "What’s the purpose of education in the 21st century?" CIESE Director Arthur Camins’ commentary in the Washington Post online is featured in The Answer Sheet by Valerie Strauss, "How to reframe the education reform debate"
CIESE WaterBotics program was honored by the New Jersey Inventors Hall of Fame, “New Jersey Inventors Hall of Fame Honors Stevens Faculty, Graduate Students and WaterBotics®"
CIESE WaterBotics program was highlighted in ASEE First Bell bulletin, "New Jersey Students Learn STEM Concepts At Water Robotics Camp"
CIESE WaterBotics program was featured in Alan Skontra's article in New Jersey Tech Weekly, "Hoboken Students Learn STEM Concepts at Stevens Water Robotics Camp"
CIESE WaterBotics program was featured in Stevens University News, "WaterBotics Summer Camp Returns to Stevens to Help Groom Next Generation of Engineers"
CIESE Director Arthur Camins’ article is featured in Education Week, "Next Steps for the Next Generation Science Standards"
CIESE WaterBotics program was featured in Amanda Eisenberg's article in The Jersey Journal, "Hoboken middle school students build robots, learn programming"
CIESE Director Arthur Camins’ article is featured in Huffington Post, "Arguing for Science Literacy"
CIESE was featured in Dean DeChiaro's article in the Hoboken Reporter.com, "Toxic popcorn"
CIESE Director Arthur Camins’ commentary in the Washington Post online is featured in The Answer Sheet by Valerie Strauss, "What if we approached testing this way?" CIESE PISA2 program was featured in Daniel Nee's article in The Brick Patch, "Brick Teachers Partner With Stevens Institute to Enrich Science Lessons"
CIESE PISA2 program was featured in Felix Alarcon's article in The Jersey Journal, "Bayonne teachers 'back-to-school' program paying off for students"
CIESE Director Arthur Camins’ commentary in the Washington Post online is featured in The Answer Sheet by Valerie Strauss, "How thinking like an engineer can help school reform"
CIESE Director Arthur Camins’ article is featured in Huffington Post, "Elementary School Children Need More Time to Learn"
CIESE Bayer program was featured in Stevens University News, “Stevens Helps 500 Budding Astronauts Have a Blast at Bayer’s Alka-Seltzer® Rocket Contest at Liberty Science Center"
Stevens/Bayer collaboration on the Alka Seltzer project was featured on News 12 New Jersey, "Future rocket scientists gather at Liberty Science Center"
CIESE Bayer program was featured in Rafal Rogoze's article in the Jersey Journal, "Team of Bayonne grammar school students wins statewide Alka-Seltzer rocket contest held at LSC"
CIESE Bayer program was featured in Rafal Rogoze's article in the Jersey Journal, "Rocket launch contest at Liberty Science Center draws hundreds"
CIESE Bayer program was highlighted in ASEE First Bell bulletin, "Elementary School Students Compete in Rocket Launch Contest At Liberty Science Center on Saturday "
CIESE Director Arthur Camins’ commentary in the Phi Delta Kappa Internation online blog is featured in Learning on the EDge, "Which road will we choose?" CIESE Director Arthur Camins’ commentary in the Washington Post online is featured in The Answer Sheet by Valerie Strauss, "The problem with our 'first in the world' education obsession"
CIESE Director Arthur Camins’ commentary in the Washington Post online is featured in The Answer Sheet by Valerie Strauss, "Where's the 'collective action' in Obama education Policy?" CIESE NJ Math Science Partnership program, C-TEAMS, was featured in the AAAS Project 2061 Connections Newsletter, "New Jersey Teachers Focus on Science Assessment"
CIESE WaterBotics program was featured in Carol Milano's ASME article, “Underwater LEGOs Train Young Scientists"
CIESE WaterBotics program was highlighted in ASEE First Bell bulletin, "Stevens Institute Of Technology Summer Engineering Program Spreads To Other States"
CIESE WaterBotics program was featured in Stevens NewsPoints, “WaterBotics Summer Camp"
CIESE WaterBotics program was featured on WABC-TV Channel 7 Eyewitness News,"Underwater robots part of summer program"
CIESE WaterBotics program was used at a camp at the University of Kentucky in Lexington, "Aquabots at the University of Kentucky "
CIESE WaterBotics program was featured on News 12 New Jersey, "Stevens Institute of Technology: WaterBotics Camp"
CIESE Director Arthur Camins’ commentary in the Washington Post online is featured in The Answer Sheet by Valerie Strauss, "Three core values of science, engineering and how ed reform contradicts them"
CIESE WaterBotics program was featured in Travis Fedschun's article in the Jersey Journal, "At Stevens, LEGO blocks build middle-schoolers’ excitement for science, engineering"
CIESE WaterBotics program was featured in Travis Fedschun's article in the Jersey Journal, "WaterBotics program at Stevens Institute of Technology engages young students in science"
CIESE Director Arthur Camins’ commentary in the Washington Post online is featured in The Answer Sheet by Valerie Strauss, "The difference between live and taped lectures"
CIESE was featured in the Cranford Chronicle, “Cranford's Hillside Avenue School students make a lunar landing "
CIESE was featured in Stevens News, “Stevens’ Placement of USA Today Article on WaterBotics Program Wins Top Prize from New Jersey Public Relations Society of America"
Arthur Camins was featured in Education Week Commentary, “New Science Standards: Bound for Glory, or Running Behind?" CIESE PISA2 program was featured on WABC-TV Channel 7 Eyewitness News, "Engineering class looks to spark interest"
Arthur Camins was featured in Anthony Cody's Education Week Teacher Blog, Living in Dialogue, “Why are Education Innovations Always Slip Slidin' Away"
Arthur Camins interview on Education Talk Radio, “Engineering Ed in grades 3-8"
Beth McGrath was featured in Stevens News, “Featured Expert on Today's News"
CIESE was featured in Stevens News, “National Engineers Week is Feb. 19-25: Stevens Pioneers National Movement to Bring Engineering to K-12 Schools"
CIESE Presidential award was featured in NJ.com, "Center for Innovation in Engineering and Science Education to Receive Presidential Award from the White House"
CIESE was highlighted in the National Science Foundation press release, "President and NSF Spotlight Mentors Who Inspire America's Next Generation of Scientist"
The Center for Innovation in Engineering and Science Education has been awarded the prestigious Presidential Award for Excellence in Science, Mathematics, and Engineering Mentoring (PAESMEM) in recognition of their expertise, encouragement, and mentoring of teachers and students in science and engineering—particularly those who belong to groups that are underrepresented in those fields. CIESE will be honored with this award at a ceremony at the White House. 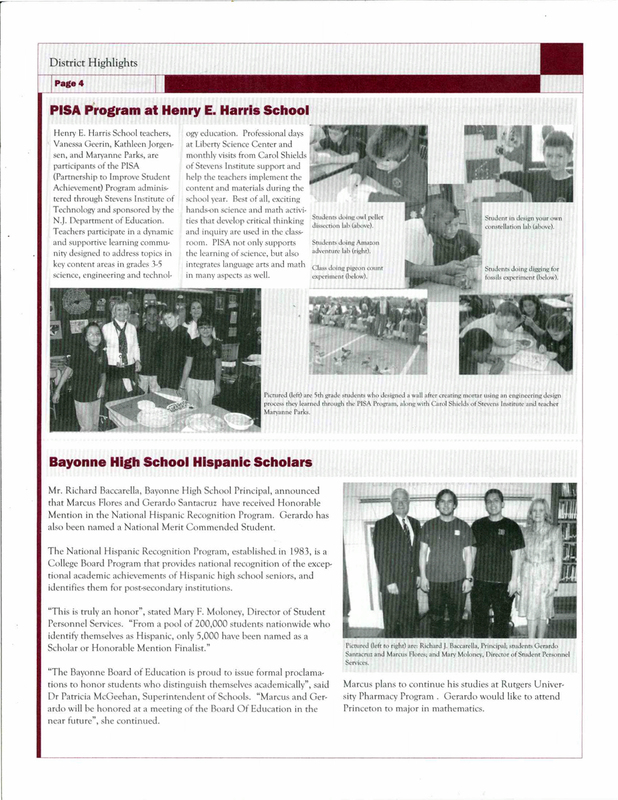 CIESE PISA2 program was highlighted in Bayonne Board of Education District Highlights, “Woodrow Wilson School PISA”. CIESE PISA2 program, was featured on WABC-TV Channel 7 Eyewitness News, "Jersey City students learn rocket science"
CIESE Executive Director, Beth McGrath is cited in Forbes.com, "Stevens Institute of Technology Ranks in Forbes top 20 "
CIESE PISA2 program was featured in Leslie Brody's article in The Record, "Lessons shaped to get students on right track"
ASEE First Bell reports on eSchool News article in which CIESE Executive Director, Beth McGrath is cited, "Study Finds Uncertainty Around National K-12 Engineering Standards". CIESE PISA2 program was featured in the Hoboken Press, "Stevens Institute of Technology launches statewide initiative"
CIESE PISA2 program was featured in Leslie Brody's article in The Record, "Grant to aid science teachers"
CIESE PISA2 program was featured in Katie Colaneri's article in The Jersey Journal, "Hands-on, minds on: Hudson County schools show off new statewide science initiative in Hoboken"
CIESE PISA2 program was featured in the Hoboken Reporter, "Rep. Sires helps celebrate science at Stevens"
CIESE PISA2 program was featured in Clair Moses' article in the Hoboken Patch, "Congressman Sires celebrates grant to improve sciences for Hudson County teachers"
NJTEA Update #8 “NJTEA and Stevens Institute of Technology Collaborate on the SAGE Project, offer Free hands on Professional Development Workshops, Classroom Materials and $50 Stipends"
CIESE CTEAMS was highlighted in the Earth Science links section of the NJSTA September 2010 Newsletter, "The Center for Innovation in Engineering and Science Education"
CIESE Honeywell project was highlight in Honeywell's Online Newsletter, "Student Innovation Day brings the Classroom to Life"
CIESE CTEAMS program was featured in Anna Yukhananov's article in the Jersey Journal, "Stevens Institute hosts intensive workshop in math and science teaching for 70 teachers from 19 districts, including Bayonne, Jersey City, Union City, Secaucus, Weehawken"
CIESE CTEAMS was highlighted in ASEE First Bell bulletin, "Stevens Institute Hosts STEM Workshop for Area Teachers"
CIESE CTEAMS program was featured in Anna Yukhananov's article in the Jersey Journal, "Hoboken's Stevens Institute of Technology gets $1.7 million to train teachers in math and science"
CIESE CTEAMS program was featured in Mel Fabrikant's article in the Paramus Post, "Stevens Institute of Technology Awarded NJ Department of Education Mathematics and Sciences Partnership Program"
CIESE CTEAMS program was featured in the Hudson Reporter, "Stevens grant may help various local schools"
CIESE CTEAMS program was featured in Bryan Wassel's article in the Jersey Journal, "Teachers to go deep into science"
CIESE SAGE program was highlighted in ASEE article that appeared in the eGFI newsletter, "Creative Destruction - Web Resource: K-12 Engineering Projects from Stevens Institute of Tech"
CIESE PISA2 program was highlighted in ASEE First Bell bulletin, "STEM Program Seeks To Foster Skills In Creativity Innovation"
CIESE PISA2 program was featured in the Jersey Journal, "Stevens gets $1.5 million to sharpen grade-school teachers' skills"
CIESE program participant recognized for her MSP-PISA teacher training classroom strategies, in the THE Journal, "Making the Connections"
CIESE Underwater Robotic's program was highlighted in Observer Reporter, "Academy students embracing engineering"
CIESE was featured in the Fall 2009 Stevens Review, "CIESE Helps Educate Tomorrow's Engineers"
CIESE NSF ITEST Scale-Up Grant Award was highlighted in the ITEST Learning Resource Center, November 2009 Community Update. CIESE was featured in Stevens institutional advertising in the Star Ledger, "Fueling New Jersey's Economic Engine Through STEM Education"
The Engineering Our Future NJ program as well as three research papers reporting on CIESE engineering education research were cited in the newly released publication by the National Academy of Engineering, "Engineering in K-12 Education: Understanding the Status and Improving the Prospects" (2009, National Academies Press, Washington D.C.). NSTA Blogs - Early Years Blog: CIESE projects "Bucket Buddies" and "Square of Life" are highlighted in an article "Citizen science: collaborative projects for teachers and their class." CIESE-led program, Honeywell Teachers for the 21st Century, was featured on WABC-TV Channel 7 Eyewitness News, "Learning new classroom tricks"
CIESE BUILD IT Underwater Robotics’ competition was featured on Live Science.com, "Boat-'Bots for Brainiacs: LEGO Subs Launch Young Engineers"
CIESE BUILD IT Underwater Robotics’ competition was featured in Stevens Undergraduate Admissions Blog, "Build IT"
CIESE SAGE project was highlighted in the Advertiser-News (North), "Three High Point technology teachers receive awards"
CIESE Bucket Buddies project was highlighted in the Springfield Reporter, VT, "Bucket Buddies Look for Life in Vermont's Ponds"
CIESE PISA Program was highlighted in Bayonne's Community News, "Kathleen Jorgensen named Harris' Teacher of the Year"
CIESE PISA Program was featured in Bayonne's District Highlights, "PISA Program at Henry E. Harris School"
Angela Kadian, fifth grade teacher at Woodrow Wilson School in Bayonne, NJ and participant in CIESE’s Partnership to Improve Student Achievement program, is a recipient of the NJ Technology Education Association 2009 Innovative Technology Educator Award. This award, sponsored by the Martinson Family Foundation, recognizes extraordinary contributions and performance by educators with an unrestricted cash award of $10,000 to each honoree. Angela's award-winning teaching unit is entitled "Creating and Enhancing Technologies that Benefit the Planet" and it is composed of multiple science/technology lessons and activities that concentrate on sustainability and the role that engineers play in protecting, preserving, and improving our environment. Dan Fagan, a CIESE Partnership to Improve Student Achievement participant and third grade classroom teacher at Wallace School inHoboken, NJ, has been selected to serve as the elementary representative on the Best Practices Panel at the American Society for Engineering Education (ASEE) 2009 Annual Conference. Dan’s work exemplifies how a classroom teacher can successfully integrate engineering activities into the existing science curriculum. CIESE collaborative projects highlighted in "The Math Forum Internet News"
CIESE collaboration with IEARN's Four Rivers, One World project is highlighted in the "January 2009 issue of the Association for Supervision and Curriculum Development's Education Update"
CIESE Curriculum and Professional Development Specialist, Jason Sayres, Boiling Point Project, is featured in ASEE's Go Engineering, "Remove Pollutants from Water"
CIESE Sr. Curriculum & Professional Development Specialist, Carol Shields, is featured in the Bayonne Community News, "Pigeon Walk"
CIESE work with Honeywell and Jersey City teachers is discussed in article an on Honeywell in the October 2008 issue of the New Jersey Business, "Honeywell International"
CIESE Sr. Curriculum & Professional Development Specialist, Carol Shields, is featured in the Bayonne Community News, "Woodrow Wilson students join environmental study"
CIESE programs was featured in Stevens 2005-2007 Annual Report, "Engineering Turns on K-12 Students"
CIESE Build IT program was featured in Sentinel, North/South Brunswick, "Students 'ship' off to Stevens Institute for robotics workshop"
CIESE was highlighted in Edutopia: Project Learning, "Start Me Up: Project-Learning Primers"
CIESE Honeywell program was featured by ASEE, "New Jersey technical college to offer STEM training for teachers"
CIESE Honeywell program was featured in the Bayonne Community News, "Catching up in Math & Science. Honeywell and Stevens Tech hold workshop for teachers"
CIESE Honeywell program was highlighted in The Teaneck Suburbanite, "No vacation for three Teaneck teachers"
CIESE programs were highlighted in The Stute, "Center for Innovation in Engineering and Science Education"
CIESE Honeywell program was featured in The Jersey Journal, "Teachers become students at Stevens"
Engineering Our Future NJ is discussed in Article, "Advancing Engineering Education in P-12 Classrooms"
CIESE Honeywell program was highlighted in The Jersey Journal, "Winning Strategies"
CIESE ITEST Build IT program was highlighted in the MyCentralJersey.com, "Incubating Ingenuity"
Wallace School News, "A Reason to Celebrate", CIESE staff Carol Shields is acknowledged for her work with Wallace School and contribution toward receipt of a grant from Cornell University Lab of Ornithology. CIESE SAGE program was highlighted in Advertiser-News (North), "High Point tech teacher joins global project"
CIESE GK-12 program was highlighted in The Post Eagle, "Bergen, Stevens Institute Partner for Grant"
CIESE Engineering Our Future program was highlighted in Advertiser-News (South), "Tech studies program, department earn five-star status twice"
CIESE participant documents classroom activities resulting from Stevens workshops in Connect magazine, "This Class Is for the Birds!" CIESE Engineering Our Future programs was highlighted in the Bergen Record, "Training tomorrow's engineers"
CIESE programs was highlighted in Multimedia & Internet@Schools, "Global Connections"
CIESE program PISA was highlighted in the Bayonne Community News, "Woodrow Wilson School takes upclose look at pond life"
CIESE program ITEST Build IT was highlighted in The Record, "Alpine students take robotics class"
CIESE program ITEST Build IT was highlighted in The Record, "Seventh- and eighth-graders get their feet wet in robotics"
CIESE, Honeywell, Jersey City Partnership, Teachers for the 21st Century, featured in the Aquatic International, "Honeywell Teachers for the 21st Century Equips Jersey City Teachers"
CIESE program ITEST Build IT was highlighted in the Westfield Leader, "Teachers Participate in 'Build IT' Program"
CIESE program ITEST Build IT was highlighted in the Sunday Courier News, "Westfield Winning robots"
CIESE Engineering Our Future programs was highlighted in the Twin-BORO News, "School bells ready to ring"
CIESE programs was highlighted in The Star~Ledger, "Grants boost math and science teaching"
CIESE was highlighted in Bloomfield Life, "Grant awarded to further science education"
CIESE programs was highlighted in The Record, "$4M in grants to benefit teachers of math, science"
CIESE program ITEST Build IT was featured in the Ocean County Observer, "Lego learning: Robotics bring science to earth"
CIESE, Honeywell, Jersey City Partnership, Teachers for the 21st Century, featured in News 12 NJ broadcast. 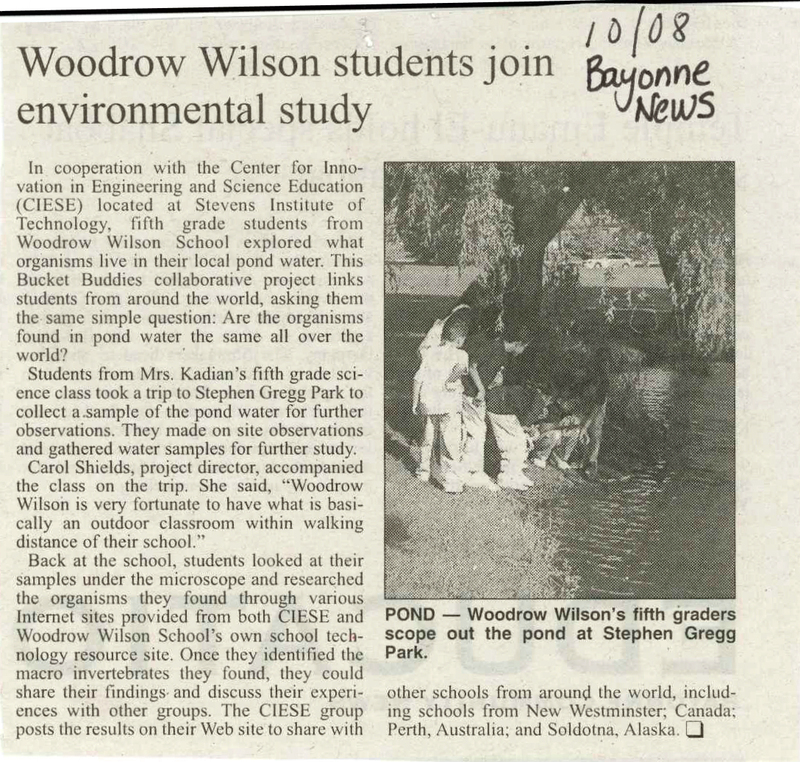 The NSF-sponsored BUILD IT Project in which teachers and students from 36 middle and high schools across New Jersey learn science, engineering and IT in the context of an engaging underwater robotics projects is featured on Cablevision broadcast on August 6, 2007. CIESE program ITEST Build IT was feature in the Suburban Trends, "Four take part in scientific experiment at tech school"
CIESE program ITEST Build IT was highlighted in the West Essex Tribune, "Livingston People"
CIESE program ITEST Build IT was feature in the Luso-Americano, "NJ/NY teachers to participate in Stevens’ National Science Foundation ITEST program BUILD IT project uses underwater robotic vehicles to build IT and pre-engineering skills"
CIESE program PISA was highlighted in The Courier-News, "Teacher will work with science center"
CIESE Honeywell Teachers for the 21st Century was featured in The Jersey Journal, "Aiming for WOW"
CIESE program Honeywell Teachers for the 21st Century was featured in an ABC Eyewitness News broadcast. Engineering Our Future NJ is highlighted in the Twin-Boro News, "Transfiguration Academy Successes, challenges of its first year"
CIESE K-12 Engineering Programs is highlighted in the TIE Online magazine for design & technology education, Spring/Summer 2007: "CIESE Pre-Engineering and Technology Education: Perfect Together"
Engineering Our Future NJ program was highlighted in Teaneck Suburbanite: "Students learn engineering concepts"
Engineering Our Future NJ program was highlighted in Teaneck Suburbanite: "Science Students take on projects"
Stevens editorial on Engineering Education was feature in The Star~Ledger: "Schools must build a culture of creativity"
The CIESE Engineering Our Future NJ program is highlighted in Home News Tribune, East Brunswick: "Engineering a successful career path"
The CIESE Engineering Our Future NJ program is featured in the Courier News: "Educators seek to engineer the future. Stevens Institute program aims to introduce engineering to the classroom"
NSTA features CIESE in their monthly newspaper Vol. 18-No. 6 in article: "NJ Center Supports Science Education Worldwide"
Classroom Connect highlights two CIESE projects in their December 2006/January 2007 issue: "Movies in the Making" and "Historical Treasure Chests". The CIESE ITEST Grant announcement was cited in article: "Stevens Institute Wins Grant", NJBIZ eBusiness research Journal. CIESE staff member Liesl Hotaling is featured on the NJECC website, where she can be heard discussing the Savvy Cyber Teacher® program. CIESE Real Time Data projects were cited in article: "In and around the classroom", N.J. Department of Education, NJ Professional Education Port. The CIESE Engineering Our Future NJ program is cited in article: "Class finds toy-building is more than child's play" in the Sentinel, North Brunswick. CIESE Director, Beth McGrath was cited in article: "Tenafly High goes for engineering in future" in the Press-Journal, North Edition. CIESE staff member Liesl Hotaling was featured in article: "Learning Curve" in the Home News Tribune. CIESE staff member Liesl Hotaling was featured in article: "Lessons In Innovation" in the Asbury Park Press. CIESE Director, Beth McGrath was cited in article: "MAST students learn engineering by building, not by book" in the Red Bank - Middletown Reporter. CIESE Director, Beth McGrath was cited in article: “NAHS students could trigger change in science classes” in The Leader. CIESE Director, Beth McGrath was cited in article: “Engaging Tomorrow’s Engineers Today” in NJBIZ. CIESE Director, Beth McGrath was cited in article: “Hickey takes part in EOFNJ” in the Teaneck Suburbanite. CIESE Director, Beth McGrath was cited in article: “Program hopes to “engineer” interest” in the Northern Valley Suburbanite. CIESE Director, Beth McGrath was cited in article: “Schools join experiment” in the Northern Valley Suburbanite. CIESE Director, Beth McGrath was cited in article: “Science teachers learn about engineering” in the Secaucus Reporter. CIESE Director, Beth McGrath was cited in article: “ Lafayette teacher gets engineering training at Stevens” in the Chatham Courier. CIESE Director, Beth McGrath, along with Hal Raveché, president of Stevens, cited in article: "The mystery of teaching science ... solved!," in The Christian Science Monitor. CIESE's Savvy Cyber Teacher® program is announced in the Science Museum of Minnesota newsletter, the Bog Hopper. New Resources, Federal Resources for Educational Excellence, CIESE is listed as a resource. Big Deal Book included CIESE's Savvy Cyber Teacher® program under its Professional Development listings in their June e-newsletter. The Savvy Cyber Teacher® program is also listed on page 42 in the Big Deal Book, mailed annually to over 40,000 schools. Big Deal Books contain resources of interest to various audiences within the education market. CIESE's Savvy Cyber Teacher® program is listed in the JETS e-newsletter. JETS, the Junior Engineering Technical Society, is a non-profit education organization, established in 1950 to inform and excite young people about careers in engineering. The New Jersey Educator's Association (NJEA) included an announcement in its May issue of the NJEA Review to support promotional efforts for the CIESE professional development program, Savvy Cyber Teacher®. The news item, "Become a Savvy Cyber Teacher" was featured in its monthly column: "Sussex to Cape May." NJEA is the state affiliate of the National Education Association. T.H.E. Journal included a prominent news blurb announcing the CIESE Savvy Cyber Teacher® professional development program in its Late Breaking News section on page 14 of the May issue of T.H.E. Journal. T.H.E. Journal (Technological Horizons in Education) is one of the most widely read education technology publications, serving educators for over 30 years. eSchool News Online, "Stevens-Newark collaboration results in improved science achievement"
T.H.E. Journal, "Collaborative P.D. Program Improves Science Achievement for N.J. Schools"
Sentinel, Vails Gate, NY, "Mount Professor Chosen to Develop National Program"
Hoboken Reporter, "Tech support: Hoboken-Stevens Partnership for Public Education turns three, develops programs"
The Math Forum @ Drexel, "The Noon Day Measurement Collaborative Project"
Stevens Views, Faculty News, p. 8-9, "McGrath appointed CIESE Director"
Environmental News Network, "Young Students Use Water Monitoring Projects to Learn about Mayflies, pH and Each Other"
T.H.E. Journal, News section, "Savvy Cyber Teacher Summer Institute"
Fairfield , NJ , New Jersey Business, "Elisabeth McGrath is appointed Director of CIESE" Digital Library for Earth System Education, "Wonderful World of Weather"
Classroom Connect Library Hot Five, " Down the Drain"
DA District Administration, Curriculum Update, "The latest developments in math, science, language arts and social studies - Q&A with Beth McGrath: Real-Time Math & Science"
NSTA's Science and Children, "The Adventures of Bucket Buddies" by Carol Shields, 30-34. Mathematics Teacher, “Mathematics Online Projects Connect Students Worldwide” by Meg Turner, Volume 97, Issue 4, 303. T.H.E. Journal, from the Hoboken Reporter, New Jersey , "Teaching with Technology - Local educators give high marks to Star-W program"
Hoboken Reporter, New Jersey , "Teaching with Technology - Local educators give high marks to Star-W program"
Teachers as Leaders & Learners, The College of New Jersey , "Graduate Science Course"
Evanston , IL Monthly, "Fulbright grant brings Afghan women teachers to Stevens for training"
Currents (publication of the Lore-El Center ), "The Lore-El Center Host Afghan Woman Teachers"
Taproot, " Square of Life : Studies in Local and Global Environments"
ENC Focus, Social Studies and Math, "The Stowaway Adventure"
RBS Currents, "Organizations Supporting Technology in the Classroom"
RBS Monthly Newsletter, Online class activities, "Boil Boil"
Christian Science Monitor, "Math teachers go from Kabul to Hoboken "
Montgomery Extra, DC, "Afghan Teachers See What They're Missing"
Asbury Park Press, NJ, "Marine center to learn and teach more about ocean"
Stevens Indicator, "Shining light on technology in education"
ENC Focus, On-line, Digital Dozen, " CIESE Online Classroom Projects"
T.H.E. Journal, "Teacher Models of Technology Integration"
Engineering Times, Alexandria , VA , "Technology-to-Classroom Is Training Center's Focus"
Riptides, November 2002, "Exploring Mathematics in Hoboken , NJ "
Intel Education: An Innovation Odyssey Day 187, "Getting Their Feet Wet"
The Hoboken Reporter, New Jersey , "Cutting through the smog - Whitman visits Hoboken to unveil new educational website on ground level ozone"
Stevens Views, "Stevens works for strong support in Hoboken "
Tribune-Review, Trib North, PittsburghLIVE.com, "Astronomy class takes measure"
nj.com & Jersey Journal, New Jersey , "Kids hear EPA pitch at Stevens on air quality monitoring"
EPA Press Release, Media Advisory, "EPA Administrator Christie Whitman will launch Educational Web Site at Stevens Institute of Technology in Hoboken , New Jersey "
The Miami Herald, MDCC News, "Technologies center opening will fill job need"
Goddard Space Flight Presents the Group Achievement Award to Ihor Charischak for "Excellence in Outreach NASA/Stevens Institute of Technology Telementoring Program"
George Lucas Foundation, eduTopia, " Square of Life "
The Classroom Flyer "INTEGRATING TECHNOLOGY: SQUARE OF LIFE "